Free cancellation up to15 days before your check in. We charge 100% for no-shows. Please contact us if you have any questions regarding our cancellation policy. The Owner/Manager agrees to rent to the client the vacation property detailed in your confirmation email which also indicates your rental time frame and maximum occupancy. The apartment will be delivered in good order, clean, fully furnished and with fresh linens and towels. The Owner/Manager has contracted with local utilities to provide water, gas, electricity and Internet access and TV, but can’t be held responsible for outages on the part of these utility providers. The property is offered for occupancy during a limited period of time mentioned in the reservation confirmation email. 1. The client is at least 18 years old and is making this reservation for himself. As such, you will personally be present at check-in and will present your passport or identity card if requested. 2. The client takes full responsibility for all occupants, also referred to as Guests, on the premises during the occupancy. 3. DEPOSIT AND PAYMENTS: 15% of your reservation is requested to within 24 hours of your booking. The remaining total can be paid at check in. Please review your reservation and make sure all the information including check in and check out dates are correct. ACCEPTED PAYMENT TERMS: Credit Cards, or Cash. We do not accept checks. 4. RATES: Rates, terms and applicable taxes are subject to change without notice. We reserve the right to move Guest up to 30 days in advance to a comparable property or refund the Guest the amount paid. 5. A Euro 150, 00 Security Deposit must be paid upon arrival. It can be paid by credit card or cash. We do not accept checks. b) The house and contents are left in good order, clean and with no breakage or damage beyond normal wear and tear. In the event of damages beyond normal wear and tear, the client agrees to reimburse the OM the actual costs arising from excessive clean-up, missing items, repairs, replacement, and, if necessary, costs incurred for removing Client and Guests from the property. DAMAGE AND CLEANING ISSUES: Any damage or cleaning issues noticed upon arrival should be reported to the owner immediately. If damage or cleaning issues are not reported within 3 hours of your arrival, your credit card may be charged for the cost of the repair. All general maintenance issues should also be reported so the unit can be kept in good repair. If you experience any problems whatsoever with the vacation property during your stay, please contact us and we will do our best to rectify the matter as soon as it is practically possible. The Security Deposit will be returned at check-out if no damage is found at the premises, except in case of check-out before 8h00. Since it is not possible for the OM to be at the vacation property before 8h00, the security deposit will be returned by bank transfer or Paypal within 48 hours after the check-out day. The OM reserves the right of holding the full security deposit in case a thorough evaluation of the premises is considered necessary. 6. CREDIT CARD AUTHORIZATION: Client responsibility is not limited to the Damage Deposit amount of Euro 150, 00. The client understands and consents to the use of the credit card provided without original signature on the charge slip, that an email of this agreement will serve as an original and that this Credit Card Authorization cannot be revoked and will not terminate until 90 days after the rental is vacated. Additional charges may include: unauthorized long distance telephone calls and video rentals charges; excessive cleaning fees; damages beyond normal wear and tear and unreturned keys. Other charges not covered by this rental agreement may be included if damaged was caused to the property. 7. The premises shall be used for residential purposes only during the established period of time. 8. Standard Check-in is between 16.00 and 21.00, check-out is at 10h00. Non-standard check-in and check-out times must be pre-arranged and approved by OM in writing. Check-ins between 21h00 and 00.00 will have a surcharge, defined as Late Check in Fee, of Euro 30,00; We don't do check ins after 00.00. Check outs before 08.00 AM the security deposit is returned by bank transfer, to your Credit Card, depending on how you have paid, up to a maximum of 48 Hours. 9. The maximum number of Guests onsite must not exceed the 'Number of Guests' stated in your "Reservation Confirmation" email. Violation of this clause will result in immediate termination of occupancy and forfeiture of all payments. 10. Smoking is not allowed in any of our units. Smoking is not allowed outside by any open window/door. Smoking is permitted on balconies as long as the doors and windows are closed. Violation of this clause will result in immediate termination of occupancy and forfeiture of all payments. 11. Client and Guests will peacefully and quietly occupy the premises and will conduct themselves in a manner inoffensive to the neighbors. Client and Guests will not permit activities on the premises that are contrary to any law, ordinance and/or applicable health or fire provisions. Violation of these conditions will result in immediate termination of occupancy, forfeiture of all payments and may incur in lawsuit. 12. OM is not responsible for any injury to Client or Guest inside or outside the vacation property rented, or for damage to personal property incurred during your stay. Properties are not equipped for the elderly or handicapped. Although some complementary child-safety features may be provided, OM is not liable for the safety of children. 13. With a minimum of 24 hours’ notice, Owner/Manager shall have the right to enter and inspect the premises at reasonable times to ensure maintenance and safety. In an emergency, OM may enter at any time without securing prior permission of Client. 14. Client may not let, sublet, or assign this rental agreement. 15. This agreement does not create a long-term tenancy for the property. Client and Guests can be removed from the property without process of law if they do not depart at the check-out day and time indicated in the "Reservation Confirmation" email. 16. Please contact us promptly if you believe you have left personal belongings at the property after check-out. 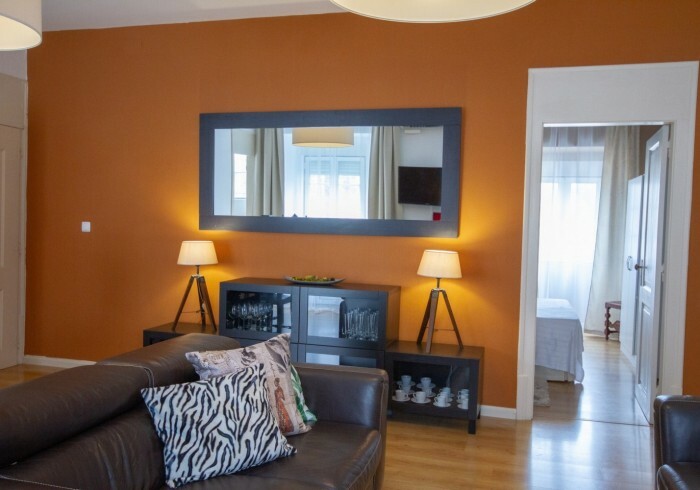 Sweet Lisbon Arts is our holiday apartment located in trendy Principe Real district, close to public transports and the one of the main business areas in Lisbon. Decorated with elegance and comfort, our vacation rental is a tribute to our favorite Arts: Painting, Cinema, Dance, Theater, Music, Literature, Photography and Architecture. The building was built in 1854 and though there are no traces of the old design in the interior, during our renovation we were able to uncover a few of the frescos that decorated the walls at the time. Our home has 3 spacious bedrooms, sleeps 6. The bedding is flexible and they can easily be turned into 3 queen beds or 6 single beds. The large living-dining area has seating for six. Fully equipped kitchen and 1 bathroom with shower. Living room and the red bedroom have A/C, Grey and Brown bedroom have fans. WIFI can be access all over the apartment. We also have provided a Chromecast for the living room which you may use with several apps on your smartphone or tablet. 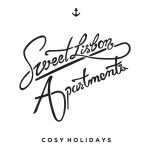 Sweet Lisbon Arts is within easy walking distance of main attractions, excellent restaurants and biologic food market on Sundays. During the week you can buy fresh fruit from the stand on the corner. It's ideal for holidays with family and friends, business travels or longer stays. We will receive you at the apartment, show you how everything works and give you all the tips you need. If you arrive after our closing time, there is no problem, 48 hours before your arrival we'll send your access codes. This way you can arrive any time you need without any problems or extra charges. Our main goal is that your stay with us will enhance your visit and make your holidays Sweet! We are looking forward to meet you. See you soon! Important note: The apartments in on a 2nd floor without elevator and very steep stairs, we do not recommend it for people with locomotion difficulties.